At Bitesize Irish Gaelic we’re always trying to learn more about our community and what exactly are our members’ goals in the matter of learning Irish Gaelic (and making a connection with their Irish heritage – where this is important to them). When asked about their goals, people who study the Irish language say that they would want to be fluent in Irish. Listen to the 72nd Bitesize Irish Gaelic Podcast episode and find out the answer. In this podcast episode, Eoin from Bitesize talks about how learning a new language is similar to starting a business and how easy it is to beat yourself up when you’re feeling you’re not making enough progress learning a new language. Episode 72 is quite interesting because it helps you understand that “one bite at a time” is a great tactic to use when learning something new. This and a lot more is covered in the podcast episode, including 2 new questions from our listeners. Don’t forget, you can record your own question for our podcast. 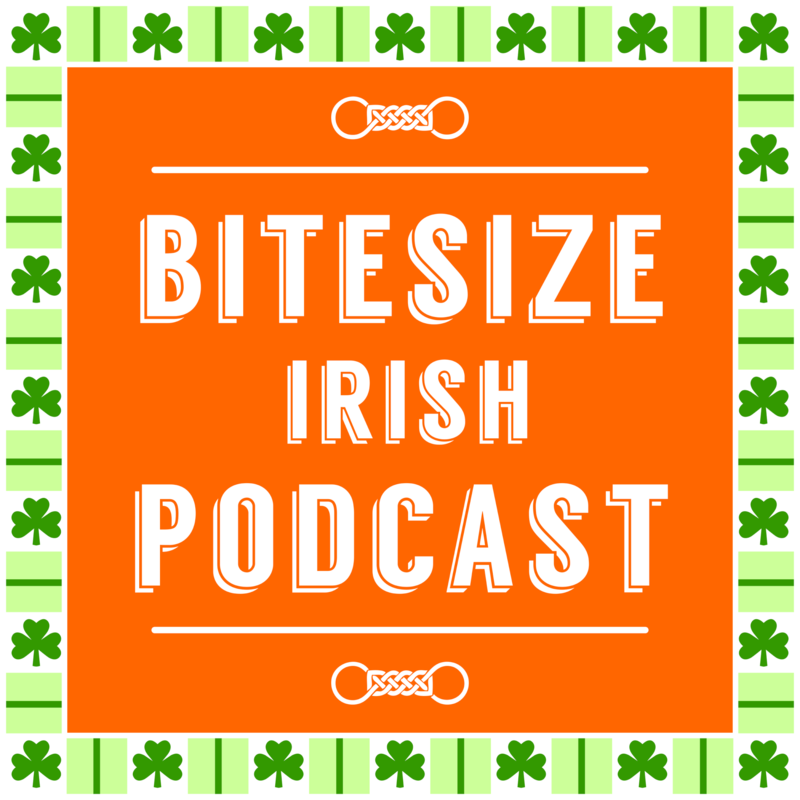 Just head over to the following page: https://bitesize.irish/podcast and record your audio message. We recommend that you have the question already written down. Introduce yourself and let us know what’s your questions. We’re featuring 2 questions in every podcast episode so your question will be answered. According to serial entrepreneur Dan Andrews, it takes 1000 days of full time commitment to build a business that can sustain you. And that’s probably in your native language! So imagine how long it could take to become proficient in Irish Gaelic. I’m Eoin from Bitesize Irish Gaelic. 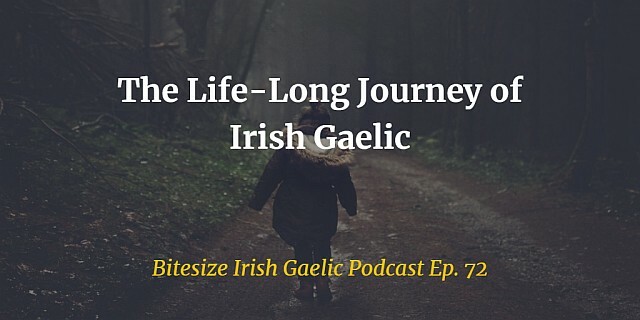 Welcome to ep 72 of the Bitesize Irish Gaelic Podcast. Even if you’re alone in your Irish language journey, rest assured that there are thousands like you, all around the world, on this same journey. Dedicating your life energy to building something, to achieve a business that can sustain you. If life was really easy, then you probably wouldn’t feel the need to invest energy into things like reaching into your ancestral language. You’re on this journey for a reason, the reason is already within you. Don’t compare yourself to others today. There will always be people who seem to be doing better than you. Ask what you can do today that will by a tiny increment further than yesterday. You don’t “do” a project. You don’t “do” learning the Irish language. You take tiny gradual steps toward its outcome. And it’s possible to pick out a next step to take that you can do THIS week. An ancient ceremonial site in Westmeath. See Ep 071. It can rewire your brain by learning it. For me, personally, it shows me that diversity in the world is the answer, not homogenisation. The Irish language represents for me a shared purpose, but also something deeply meaningful. It points to what Jordan Peterson says is to follow what’s of interest to you, deeply. That will inform your view of reality, and life. It will give you your life energy. You don’t need permission from anyone else to express your interest in this. I don’t agree with “follow your passion” because you can question if you feel “passionate” about something. But you sure as hell can answer what’s of interest to you. It’s what will pull your interest and ask you to inspect deeper. And I’m not talking about shallow pleasure such as reading your Facebook newsfeed! Wow! Neverjetno! Amazing to hear that your wife is Slovene!!! I am both Slovene and Irish. I learned Slovene as a 51 near 52 year old at a ninth month course in Ljubljana in 1997. I lived in Slovenia then for about 5 years, then back to the States. I usually speak Slovene with my friends here. Nevertheless, I am still learning Slovene – developing my skills will go on till the end of my life. I am retired and live in SLO 6 months per year and the USA 6. I try to visit Ireland every other year. I am working at learning Irish, as it was the language of my great grandparents who were from the Dingle Peninsula, Cloghane/Brandon area. It is slow but I just keep plugging along. I know my basic prayers from memory. I like singing – now can sing An Phaider by O’Riada by memory and Trathnona beag areir looking at the text – using singing as also a way to become familiar with pronunciation. I am finding that repetition is a key for me. I love your website. Right now can’t do a great deal but step-by-step! Thanks for your love for Irish and your willingness to do the work you do. Blessings! Hi Patricia, funny to hear about our shared backgrounds! I think I could learn a thing or two from you. I agree with your approach, it sounds solid: it’s all step by step.